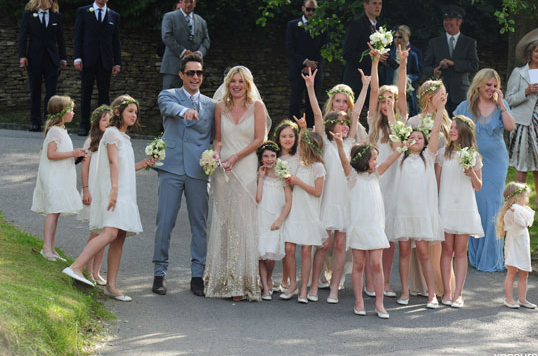 On Friday, supermodel Kate Moss said ‘I do” in a chic rock’n’ roll ceremony to boyfriend, rocker Jamie Hince. Moss and Hince got married in Southrop, England, and their nuptials will last as in the fairylates, Us Magazine reports. One of the planet’s most popular models, Kate Moss is off the market. She boyfriend Jamie Hince have organized a wedding like in the fairytales. From the dress to the ceremony, to the party afterwards, all the details seem like they are taken out from a goodnight happy ending story. Let’s start with the bride’s gown. First it has been speculated that Moss would design her own dress. But in the wedding day, the bride appeared in an astonishing sleeveless, long vintage style John Galliano dress, covered in rhinestones. The groom wore a light blue suit designed by Yves Saint Laurent. An insider gave the mag some details about how the ceremony went.” It was a wham bam rock n’ roll marriage. [Kate] came out of the church with the bridesmaids [ all children and many] and just snogged his face off — a couple of huge kisses, then the doors to the Rolls Royce opened and rock music blared out for everyone. It was a ‘Wow, Kate Moss is married’ moment. And now, the wedding. Remember how the wedding in the fairytales wouldlast three days and three nights? Well, Kate Moss must be a princess then, because she and her groom will celebrate their nuptials in a festival-inspired bash dubbed ‘Moss-stock, which will last exactly three days. Kate Moss, who is now 37 years old, met her hubbie, The Kills’s Jamie Hince, 42, in September 2007. After dating for quite a while, the couple announced their engagement in February 2011. It looks like former boyfriends Johnny Depp and Pete Doherty lost their chance for good. The model was romantically involved with Johnny Depp in the ‘90s and then had a brief engagement to rocker Pete Doherty.